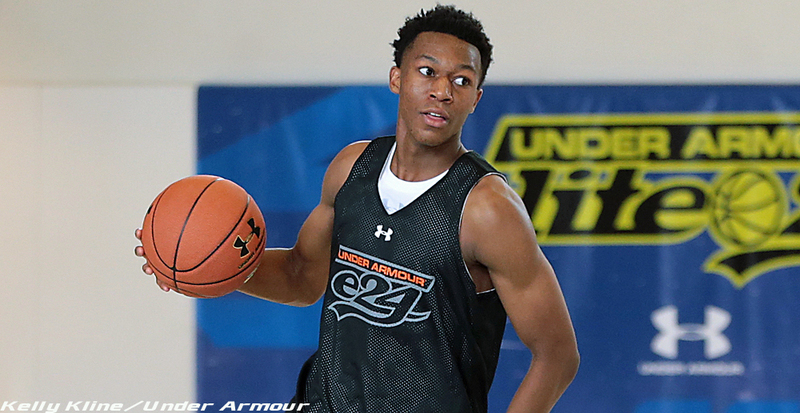 Not many rising juniors have had a more productive summer than five-star guard Tyus Battle. Battle added scholarship offers from a who’s who of high-major programs, he’s made campus visits to UConn, Villanova, Michigan, Louisville and Kentucky and he’s played in a majority of the top camps and tournaments on the summer circuit. Battle played in the Nike EYBL, excelled at Peach Jam and attended Steph Curry and Reebok’s Elite Camp. Because that wasn’t enough, he hopped in a tournament with his high school team during the first evaluation period. Despite all of the games, attention and travel, he’s hopeful to add one more date to the calendar: a trip to Dubai. Battle is trying out with an elite group of under 17 prospects in Colorado Springs to make USA Basketball’s 12 man roster to compete in the 2014 FIBA U17 World Championship (Aug 8-16th). After all of the competition that Battle has faced this summer, facing off in a tryout against the best high school players in the country doesn’t even feel like anything new. “The competition I’ve faced this summer is pretty good too because I play in the EYBL,” Battle said during a phone interview after the first session of training camp. “But USA Basketball is just the best kids in the country under 17 coming in here trying to make one team so it’s a major competition. Battle’s most recent scholarship offers are from Duke and North Carolina State. He reported that several schools stand out as recruiting him the hardest. Michigan has been paying close attention to Battle throughout the summer. The Wolverines, notably head coach John Beilein, have been in attendance just about anywhere that Battle has played this July. Michigan coaches are expected in Colorado Springs to watch Battle (and others) later today when tryouts are open for evaluation. Battle is pleased with the relationship he’s developed with Michigan’s staff. USA Basketball tryouts also led to a reunion between the 6-foot-5 guard from New Jersey and point guard target Derryck Thornton Jr. Battle and Thornton are already friends – coordinating their Michigan visit from opposite sides of the country – and they’ve been able to play on the same team during training camp. Rumors of a potential package deal have swirled in the past, but Battle reiterated that both players will make the best decision for themselves. Right now, Battle’s recruitment is on the backburner and his sole focus is on making the team in Colorado Springs. Whether he makes the cut or not, the only other plan Battle has is to be back in the gym and working on his game.